West End Walks. 20 Thomas Street. Built in 1899 for Edward P Staples. The circular bay is a bit too large and doesn’t resolve its relationship with the main body of the house well at all. The otherwise well proportioned hip roof is cut off or ‘clipped at the corner over the bay leaving an odd bit of roof there. It bumps into the front facade in an awkward way breaking the balance and putting the single window on the second floor in an uncomfortable position. Not connected to either bay or the decorative window next to it. The arrangement of the windows in the bay are no help. The small single window on the second floor doesn’t seem to want to get along with the two below. I think the smaller, 3 sided, bay behind the front one is much more appropriate for the building. The right wall of the house may be its best. The windows are grouped and placed by need but have an ordered feel. 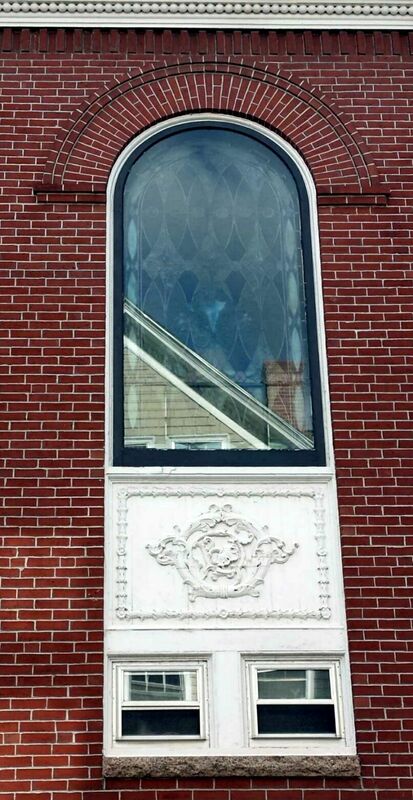 The 2 story window contains an interesting blend of function in the 2 lower windows and art in the composite panel and stained glass under a heavy arch above. It most likely marks the location of the main stairway. One last item of note on this wall. 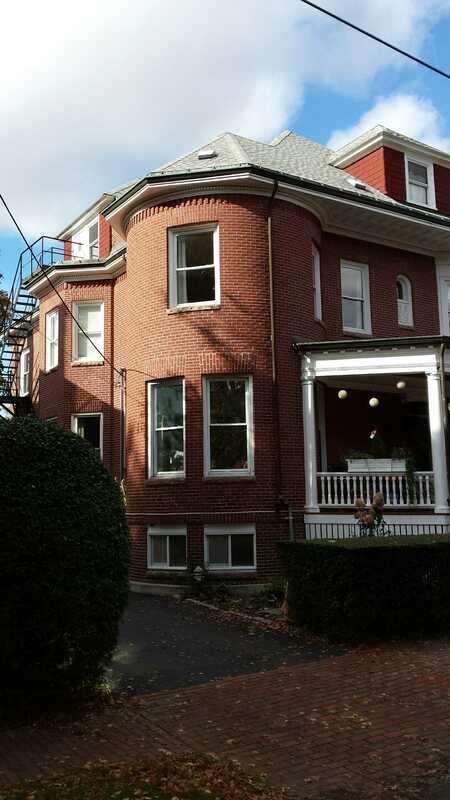 The last two windows on the first floor are grouped under a low arch inset into the brickwork above. 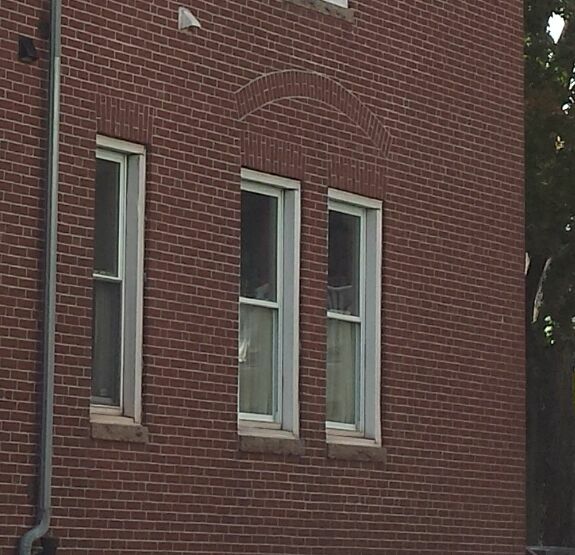 The arch springs from vertical points unlike the one over the two story window which has very prominent insteps. The arches also have different radii so the rear one is not really connected to the forward one. The lack of any instep at the spring points also shows the arch is not functional. I can only guess that maybe Steven’s or Staples wanted an expression of the space where these windows exist or, perhaps, express the form of the ceiling in the space. Certainly a bit of a mystery. Edward Staples was a partner in Bolster, Snow and Co. He and his wife, Mary, moved from Norway to Portland around 1875. Beckett lists Edward as a salesman with Locke, Twitchell & Co and living in Norway in 1873. Mary is shown on a deed from September of 1875 purchasing a property on Carleton Street. In that deed, she and Edward are listed as residents of Norway. That property was sold on October 6, 1898. This property is now a parking lot next to 20 Carleton Street. On October 17, 1898 Mary purchased the lot at 20 Thomas Street from the JB Brown Estate. This side sure looked better without the fire escape. More on that below. The colonial railing on the second floor is a nice detaí now lost. Mary is shown the owner in 1924. Edward died in November of 1924 and Mary in November of 1925. They were buried at Evergreen Cemetery. The home was sold to Edgar Curtis in March of 1926. Over the next 4 decades the property would change hands several times, finally ending up being sold to the Roman Catholic Bishop of Portland in 1969. The church retained ownership of the home under the Sisters of Our Lady of the Holy Rosary until 2010 when they sold it to the current owners. It would seem then, the fire escape was installed when the ‘Sisters used the property as a group home. This entry was posted in Architecture, Brick, History, Images, John Calvin Stevens, Thomas Street, West End Walks and tagged Brick, History, images, John Calvin Stevens, Maine, Portland, West End on October 30, 2016 by alewifecove.